No true Christmas feast would be complete without serving a wonderful cheeseboard to end the meal. Here Lovely Christmas gives you tips on how to choose Christmas cheeses so that they are at their very best. A good cheeseboard is all about taste and texture. The selection should offer a choice of mild, fresh, creamy cheese, a hard, tangy mature cheese and a strong, blue-veined variety. Also, beware of offering too much – with cheese, less is more and the best cheese-boards have four or five choices and no more. A typical Christmas cheese selection will include a Cheddar, a Brie or Camembert and a Stilton. When serving cheese, do so at room temperature and make sure it can breathe. If left covered, it tends to sweat. If possible, it is always better to buy cheese from a specialist cheesemonger or delicatessen as they will be able to offer expert advice and the cheeses will hopefully be stored in controlled conditions. Nevertheless many supermarkets have a good range of cheeses on offer and armed with the right knowledge of what to look for, you can’t go far wrong. Some supermarkets offer pre-packaged Christmas selections for you, but this takes away the sensual pleasure of choosing for yourself. Always ask to try a cheese if uncertain of the taste, as most retailers should be only too happy to oblige. Once you have selected the cheese you want, ask for a fresh slice to be cut, having first checked that the open side of the cheese is not ‘sweaty’ - indicating lack of air - or ‘cracked’ – indicating it has been allowed to dry out. Always buy cheese in its premium state and not too much at a time, to avoid spoiling. Soft cheeses, such as the Christmas ‘staples’ of Brie and Camembert should be served ‘ripe’ and just oozing a little. When choosing from a cheese counter, the cut side of the cheese should look creamy in colour and the open side just bulging. The outside should not show any sign of cracking or discolouration. To compliment the stronger cheeses, a young cheese like a goat’s cheese is a perfect choice. Windrush for instance, produced in Oxfordshire, is sold when just a few days old and has a particularly delicate fresh flavour. When selecting a goat’s cheese, pay attention to its date – this type of cheese is generally better the younger it is, although more mature and savoury-tasting options are also available. Stilton is the British cheese most traditionally served at Christmas. Its history stretches way back to pre-Roman times and today is most often served with a glass of Port or strong wine following the Christmas meal. English tradition dictates that the port is served to the left and the stilton to the right and presented as centrepiece of the cheese board. The making of stilton is carefully controlled by the Stilton Cheese Makers’ Association which helps to maintain exceptionally high standards in its production. Dairies are restricted to the counties of Derbyshire, Leicestershire and Nottinghamshire as only these areas have the correct type of grazing pasture for cows to produce milk for the cheese. Although all Stilton is based on the same formula, there are many nuances and differences from dairy to dairy, with each having its unique flavour. Stilton is protected by a certification trade mark and as such, any imported cheese labelled ‘stilton’ is contravening the rules of this mark, so always check the labelling. Stilton should be bought ‘moist’ and ‘full of energy’. If it seems dry, don’t buy it and make sure it is kept covered at home, or freeze in its state of perfection and take out for Christmas. Cheese should be bought if possible in as near a perfect state as possible and eaten straight away. But if this isn’t practical, it keeps in the freezer perfectly well for up to three months. It should be wrapped in foil first to prevent drying out. Freezing halts the action of enzymes in the cheese to prevent it maturing but when defrosted, if will return to its original state and continue maturing. 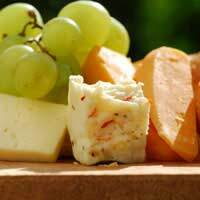 Cheese lends itself to contrasting fresh and juicy flavours such as grapes, apples and celery. These serve to freshen the palate and sharpen the savoury ‘kick’ of the cheese.